Villa Trigono is an elegant family-friendly four-bedroom villa that can accommodate up to seven guests. Located in a peaceful spot in Agios Nikolaos, a charming Greek town on the east coast of Crete. Villa Trigono is an elegant family-friendly four-bedroom villa that can accommodate up to seven guests. Located in a peaceful spot in Agios Nikolaos, a charming Greek town on the east coast of Crete, this villa boasts a private secluded waterfront location. It overlooks Mirabello Bay, and stone pathways are leading down to the sea below for swimming off the rocks. Amongst the most luxury Greek villas, Villa Trigono is an incredibly spacious and beautifully decorated space, graciously nestled among Olive trees. The main features include a private swimming pool with a hydro-massage jet and a sun terrace with panoramic views of the Aegean Sea. Here you'll find sun loungers and umbrellas for private use, a BBQ station and patio with day beds for basking in the sunshine, dining al fresco or relaxing with a good book in the shade. 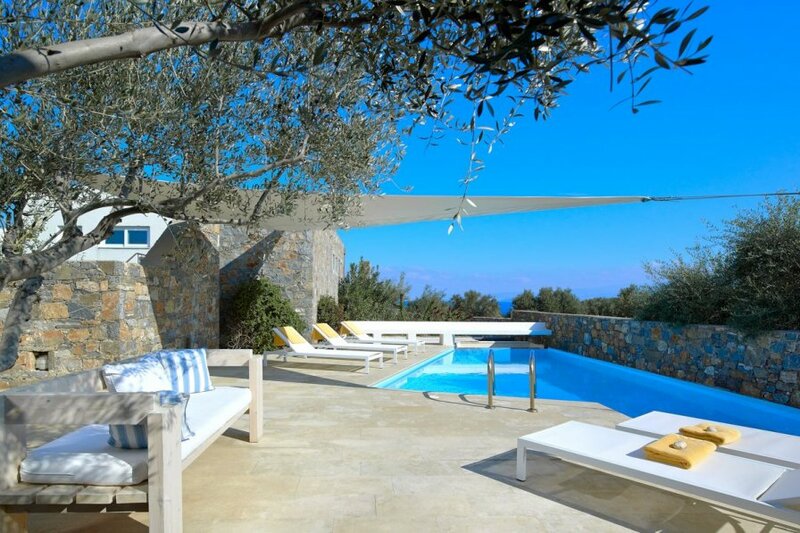 Stepping inside the villa, the fusion of rustic Greek stone walls and contemporary furnishing doesn't disappoint. There are a spacious lounge and fully-equipped open plan kitchen and dining area, with a dishwasher, washing machine and oven for a fuss-free stay. From the living room, large sliding glass doors lead out onto the terrace, creating transparency between inside and out. You can choose from four inviting bedrooms, including a master with a comfortable double bed, en-suite marble bathroom with a hydro-massage bath, separate shower and WC, or two twins and a single which share two luxury marble bathrooms with a shower and WC. With spacious wardrobes, make-up mirrors and bathrobes, towels and toiletries provided, this villa pulls out all the stops. As part of a complex, during your stay at Villa Trigono, you have access to top-notch facilities. You can unwind in the spa and have a massage or head to one of the restaurants for a drink and a bite to eat. With a maid service and option to order breakfast to your villa, Villa Trigono provides the perfect stress-free stay in an idyllic sun-kissed Mediterranean location. Located east of Crete's capital Heraklion and north of the town Lerapetra and west of the town Sitia is Agios Nikolaos. Think picturesque waterfronts, mountainous backdrops and a welcoming, laid-back atmosphere. An ideal place for nature, culture and food lovers, there are many places for you to see and visit. Explore the winding streets and browse the local shops, selling everything from handmade China to clothes and souvenirs, or head to Lake Voulismeni – a small lagoon in the centre of the town, used as a harbour where fishing boats stop and take your Instagram-worthy pictures. For lazy afternoons spent by the sea, sandy Kitroplatia Beach is a perfect choice. This popular stretch of coastline boasts crystal clear waters and is an ideal choice for children and anyone looking for a beautiful and clean beach, close to all amenities of the town. There's also Almyros Beach – this large sandy stretch is set in a closed cove, and the water is shallow so children can swim here safely. From Agios Nikolas, you are well placed to drive to the island's capital Heraklion and immerse yourself in ancient culture. The vibrant port city is best known for the Palace of Knossos. The archaeological site dates back thousands of years to the Minoan civilisation. Guarding the city's Venetian port is the 16th-century Koules fortress. A drive around Heraklion will also bring you to traditional villages, Medieval castles, Byzantine monasteries and secluded coves.